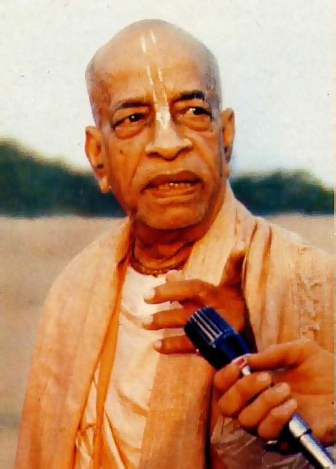 The following conversation between His Divine Grace A.C. Bhaktivedanta Swami Prabhupada and some of his disciples took place some eight years ago on an early morning walk in San Francisco. First disciple: Srila Prabhupada, recently a student committed suicide here. It’s happening all over the country. Srila Prabhupada: Some are publicly committing suicide, and others are silently committing suicide. If the human life is wasted for sense gratification, that is suicide. People have the opportunity for enlightenment, yet they live like dogs and cats. This is suicide. Second disciple: One month ago there was a big story in the papers about how a student went through the archives in the Library of Congress and compiled enough information to construct an atom bomb. They concluded that, theoretically, anyone who wanted to could gather enough information from public sources and build an atom bomb. Srila Prabhupada: This is also suicide. The atom bomb manufacturer is thinking he is successful in his life by building an atom bomb, but he does not know how to save himself from death. Nothing he has done can save him from death. So what is the use of his scientific knowledge? The dog is going to die, and he is also going to die, so where is the difference? First disciple: Incidentally, the scientists’ original purpose in building the atom bomb was to prevent death-to end the Second World War as soon as possible. Srila Prabhupada: How can they prevent death? That they do not know-how to prevent death. They can accelerate it, that’s all. Here are the real problems: janma-mrtyu-jara-vyadhi—birth, death, old age, and disease. What scientist can solve these problems? These are the really fearful problems, but where is the chemist or psychologist who can solve them? First disciple: The theory nowadays is that since Russia has so many nuclear weapons and the United States has so many, they are both afraid to use them. Srila Prabhupada: No. They must use them. That is nature’s arrangement. This is not astrology; it is a natural conclusion. There is no doubt about it. First disciple: The only difficulty is that if they use the nuclear weapons there’ll be total destruction. So everyone is afraid of using them. Srila Prabhupada: Well, total or partial, that we shall see. But the weapons must be used. If the leaders want to avoid war, they must understand three items: God is the proprietor of everything, He is the enjoyer of all work, and He is the friend of everyone. But the leaders act in just the opposite way, thinking, “I am the proprietor, I am the enjoyer, and I am the friend of everyone, because I am God.” This is demonic. Nixon was elected President by pretending to be a friend of everyone, but later on he proved to be an enemy. Nobody can be the friend of everyone except Krsna. Third disciple: But isn’t a pure devotee of God a friend to all? 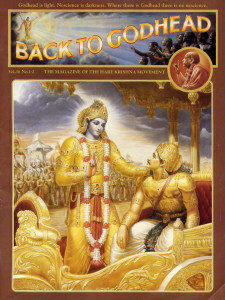 Third disciple: When we distribute your books, Srila Prabhupada, are we trying to show people we are their friends, also? First disciple: Wouldn’t the threat of nuclear warfare make Krsna consciousness easier to spread? Srila Prabhupada: The threat is already here, but people are so foolish that they are not afraid of the threat. Certainly the threat of death is already here: everyone will die. That is the real problem, but who cares for it? People are avoiding this problem because they cannot make any countermeasure. Fourth disciple: Srila Prabhupada, we constantly hear from you and your books that we will die and that we must learn how to face this. But still, even as your disciples, we’re not so convinced. We’ve been brought up in a culture that hides death. Particularly here in America, we rarely see death. Srila Prabhupada: You think you’ll not die? Fourth disciple: I know I will, but how can we come to the platform of realizing that? Srila Prabhupada: Everyone is dying. Your mother is dying, your father is dying, your friends are dying—and still you cannot understand? Then how will it be possible to make you understand? Every day, every moment, so many men and animals die. Death is inevitable, but still you are thinking, “I’ll not die.” And this is our real problem. Nobody wants to die, but everyone is dying. This problem the rascal scientists cannot solve. Sometimes we see a dog swimming in the Pacific Ocean and think, “Oh, let me grab hold of the dog’s tail, and I shall cross the ocean.” Similarly, those who are thinking the so-called scientists and philosophers will solve the problems of birth, death, old age, and disease are exactly like those who are trying to cross the Pacific Ocean by holding on to the tail of a dog. The scientists are like dogs, and to catch hold of their tails is hopeless. First disciple: So one must become convinced of the reality of death through philosophy? Srila Prabhupada: At the present moment philosophy means “mental concoction.” But real philosophy means to find out reality. That is philosophy. Not “I think like this, he thinks like this, he thinks like that.” This is mental concoction. Real philosophy is what Krsna says in Bhagavad-gita: janma-mrtyu-jara-vyadhi-duhkha-dosanudarsanam—” Always remember that there is death, that there is birth, that there is old age and disease, and try to save yourself from these by becoming Krsna conscious.” This is philosophy.